The Navy continues to develop the first-generation Unmanned Carrier-Launched Airborne Surveillance and Strike System (UCLASS), which will provide long-range, persistent ISR&T with precision strike capability, enhancing the carrier’s future ability to provide support across the range of military operations in 2020 and beyond. UCLASS will utilize the flexibility and access inherent in carrier operations to provide the Joint Force and Combatant Commanders with on demand intelligence and strike capability against time-sensitive targets while on station. UCLASS is a three-segment system consisting of a control system and connectivity segment, a carrier segment, and an air segment. The government will function as lead system integrator for the UCLASS system. The system will maximize use of existing technology to launch and control the air vehicle, transfer data, and support persistent surveillance and precision strike operations. The system will be integrated into carrier-controlled airspace operations and will be maintained in accordance with standard fleet processes as tailored for unmanned applications. During fiscal year 2010, the Office of the Chief of Naval Operations (OPNAV) updated the Power Projection from the Sea (PPftS) Beyond 2024 Capability Based Assessment (CBA) to address the 2018 timeframe. This CBA became the basis for the Unmanned Carrier Launched Airborne Surveillance and Strike (UCLASS) System Initial Capabilities Document (ICD). The Joint Requirements Oversight Council (JROC) endorsed the UCLASS ICD in April 2011 and formally approved it on 09 June 2011 via JROCM 087-11. In support of affordability and adaptability directives, JROCMs 086-12 and 196-12 redefined the scope of JROCM 087-11 and affirmed the urgency for a platform that supports missions ranging from permissive counter-terrorism operations, to missions in low-end contested environments, to providing enabling capabilities for high-end denied operations, as well as supporting organic Naval missions. The Department continues to assess the program and has issued JROCM 009-14, directing UCLASS Early Operational Capability (EOC) delivery within four to five years from Air Segment contract award. The Service approved a draft Capability Development Document (CDD) on 05 April 2013. On 19 March 2010 the Navy issued Request for Information (RFI) N00019-UCLASS-RFI-A for planning purposes, as part of a market survey led by the Navy Program Executive Office for Unmanned Aviation and Strike Weapons [PEO (U&W)]. This RFI was intended to determine the existence of sources that can provide a limited inventory of systems capable of being operated by fleet Sailors. The Deputy Chief of Naval Operations (DCNO) for Information Dominance (N2/N6) has identified a need for an aircraft carrier based aircraft system providing persistent Intelligence, Surveillance, and Reconnaissance (ISR) and strike capabilities that will enhance the versatility provided by an aircraft carrier. Over the next ten years, Navy investment will focus on defining requirements and beginning development of an unmanned capability to achieve this enhanced versatility. The Navy was interested in information on carrier based, low observable (LO) Unmanned Air Systems (UAS) concepts optimized for Irregular and Hybrid Warfare scenarios, capable of integrating with manned platforms as part of the Carrier Air Wing (CVW) by the end of 2018 to support limited operations in contested scenarios. The UAS should enhance situational awareness and shorten the time it takes to find, fix, track, target, engage, and assess time sensitive targets. The RFI was focuse on mature technology readiness levels that could achieve limited fleet operational use in 2018. IT would be operated and maintained by fleet Sailors to perform ISR / Strike (land attack) missions supporting non-autonomous target prosecution. Notional system was 4 – 6 air vehicles, carrier mission control interfaces and ashore mission control interfaces, sensor payloads, weapon interfaces, and personnel. It would feature managed susceptibility (e.g., LO air vehicle, controlled emissions, etc.) and vulnerability, and receive fuel from USN and USAF style airborne tankers. The UCLASS would carry/employ weapons payloads sufficient to complete mission tasking in vetted scenarios, and carry a suite of modular and/or federated ISR sensors with all weather capability, to include EO/IR, multi-mode radar, and ESM. Integration of existing sensors was preferred over new sensors development. Unrefueled strike radius to meet the provided vetted scenarios included unrefueled mission endurance of at least 11 – 14 hours. Design Life would be at least 9,000 hours. It would operate in weather encountered 90% of the time over an average year for each specific vetted scenario geographic area. Employ open, robust, secure and scalable software, hardware, and networking architectures. Line of Sight (LOS) and Beyond Line of Sight (BLOS) C2 and data dissemination. Ability to maintain C2 and data flow with air vehicle throughout all phases of mission. Compatible with tasking, processing, exploitation, and dissemination ashore. Non-autonomous target attack commanded from MCS. Employ lethal precision weapons to suppress, defeat, destroy, deceive, or influence a range of enemy target sets. Communicate with Special Operations Force personnel to track and engage targets. The UCLASS system will consist of an Air Segment (including air vehicle, a mission system, and a remote vehicle control system); a Connectivity and Control Segment (which includes interconnectivity to external DoD and carrier air wing assets, Navy and DoD networks and satellite systems, and existing DoD Tasking, Collection, Processing, Exploitation, and Dissemination (TCPED) systems); a CVN Segment (launch and recovery), and a System Support Segment (providing support for all of the system segments). The Government will act as the system integrator across all Unmanned Carrier-Launched Airborne Surveillance and Strike (UCLASS) segments, including Air Segment, CS&C Segment, and CVN Segment. The UCLASS Program will leverage existing Navy information dissemination and Department infrastructures, as the government-led system of systems integration is accomplished across all segments. The Government will manage the system level architecture and interfaces, and foster efficient data exchanges and integration. Specifically, the Control System & Connectivity Segment and Carrier (CVN) segments will be organically managed by the Government Lead System Integrator and will modify existing systems via the effected system's Engineering Change Proposal (ECP) and configuration management processes. These integration tasks include successful demonstration of integration with the CVN landing system, integration of control system, and integration with the Tasking, Collecting, Processing, Exploitation, Dissemination (TCPED) interfaces to include successful transmission of mission system data. The Government will develop and award contracts as required to support program activities, including limited source Firm Fixed Price contracts to mature designs to the Preliminary Design Review level of maturity, followed by a full and open competition to select one prime contractor. The Government's acquisition strategy was approved on 07 June 13. Acquisition and contracting strategies comply with current statutes, regulations, and instructions. Northrop Grumman’s X-47B has the advantage of already being tested in the unmanned combat air system demonstrator (UCAS-D) program. General Atomics Aeronautical Systems, Inc. (GA-ASI), a leading manufacturer of unmanned aircraft systems (UAS), tactical reconnaissance radars, and surveillance systems, on 03 May 2010y introduced Sea AvengerTM, a carrier-based derivative of its Predator C Avenger UAS, to fulfill the U.S. Navy's need for an unmanned carrier-launched airborne surveillance and strike (UCLASS) system. The company formally proposed Sea Avenger to the Naval Air Systems Command (NAVAIR) via a Request for Information (RFI) submitted on 30 April. Like Predator C Avenger, Sea Avenger presents a low-risk, high technology ready procurement option as it leverages more than 18 years of Predator-series UAS development, manufacturing, and system support, along with one million flight hours of operational experience. In addition, many Predator-series elements, components, and subsystems already provide mature, proven, and affordable mission capabilities desired by the Navy for a UCLASS system. Anticipating a future requirement for a carrier-based UAS, GA-ASI designed specific features into its Predator C Avenger to facilitate subsequent development of an aircraft uniquely suitable for carrier operations that would also integrate seamlessly into the carrier air wing. These include a highly fuel-efficient engine and inlet design, retractable electro-optical/infrared (EO/IR) sensor, internal weapons bay, and folding wings. The aircraft's structure was also designed with the flexibility to accommodate carrier suitable landing gear, tail hook, drag devices, and other provisions for carrier operations. The Lockheed Martin Sea Ghost Unmanned Carrier Launched Airborne Surveillance and Strike (UCLASS) air vehicle concept integrates proven technologies from F-35C, RQ-170 Sentinel and other operational systems to provide both the lowest development risk and greatest Intelligence, Surveillance and Reconnaissance (ISR) mission capability. The approach leverages the experience of the Skunk Works® and our cross-corporation team to meet the Navy’s requirements for a versatile and supportable carrier-based unmanned aircraft. UCLASS will balance endurance, early operational capability, and inherent growth that will enable operations in any environment or threat scenario. There is very sparse information about Boeing’s Phantom Ray. The Navy announced 14 August 2014 that four Preliminary Design Review (PDR) contracts were awarded for the Unmanned Carrier Launched Airborne Surveillance and Strike (UCLASS) air vehicle segment. The four $15 million firm-fixed price contracts were awarded to Boeing Co., General Atomics Aeronautical Systems, Inc., Lockheed Martin Corp. and Northrop Grumman Systems Corp. The period of performance for the contracting efforts was approximately nine months. "The PDRs are intended to inform the Navy of technical risk, cost and design maturity of the Air Segment (AS), and allows the industry teams to better understand the program's requirements across the entire UCLASS system to expeditiously deliver the unmanned carrier-based system to the fleet," said Charlie Nava, UCLASS program manager. The US Navy released a draft request for proposal (RFP) for the unmanned carrier-launched airborne surveillance and strike system (UClass) air segment to four contractors on 17 April 2014. The service expects to release a final RFP later in the year. Lockheed Martin, Northrop Grumman, Boeing and General Atomics, each of which received $15 million contracts in August 2013 to conduct preliminary design review assessments, received the draft proposal document. On 24 March 2015 US Senator John McCain (R-Ariz.), Chairman of the Senate Armed Services Committee, yesterday sent a letter to Secretary of Defense Ash Carter concerning the US Navy’s Unmanned Carrier-Launched Airborne Surveillance-Strike (UCLASS) program. Senator McCain called on Secretary Carter to ensure the Navy’s first unmanned combat aircraft is capable of performing a broad range of missions in contested environments as part of the carrier air wing, including precision strike as well as intelligence, surveillance and reconnaissance (ISR). "... I strongly believe that the Navy’s first operational unmanned combat aircraft must be capable of performing a broad range of missions in contested environments as part of the carrier air wing, including precision strike as well as intelligence, surveillance and reconnaissance (ISR). "... I strongly support the decision to assess the UCLASS program as part of the Department’s ongoing ISR review, and I look forward to working with you and the Navy to ensure that this program is optimized for the demands of future operating environments. "At the same time, I am concerned that the current requirements proposed for the UCLASS program place a disproportionate emphasis on unrefueled endurance to enable sustained ISR support to the carrier strike group, which would result in an aircraft design with serious deficiencies in both long-term survivability and its internal weapons payload capacity. I would encourage you to ensure that the Navy’s first unmanned combat aircraft is capable of both providing persistent ISR and conducting strike missions from the carrier at standoff distances in contested environments. Developing a new carrier-based unmanned aircraft that is primarily an ISR platform and unable to operate effectively in medium- to high-level threat environments would be operationally and strategically misguided. "More specifically, I would encourage you to consider what attributes could enable the UCLASS program to perform strike, as well as ISR, missions — including an unrefueled endurance several times that of manned fighters; a refueled mission endurance measured in days; broadband, all-aspect radar cross-section reduction sufficient to find and engage defended targets; and the ability to carry internally a flexible mix of up to 4,000 pounds of strike payload. This would expand the strike range and lethality of the carrier strike group, thereby ensuring its role as the preeminent tool of naval power projection. "Additionally, while this review is underway and until a restructured UCLASS program yields flying prototypes, I would encourage you to maximize the use of the Unmanned Combat Air System Demonstration (UCAS-D) program in order to gain technological and other insights that could help increase the effectiveness of the UCLASS program. Our nation has made a sizable investment in this demonstration program to date, and both air vehicles have consumed only a small fraction of their approved flying hours. Under current plans, starting this April, there will be no unmanned air vehicles operating from carrier decks for several years. I think this would be a lost learning opportunity in what promises to be a critical area for sustaining the long-term operational and strategic relevance of the aircraft carrier." Experts and American officials believe that the future of carrier-based aircraft and the U.S. Navy component will depend on the creation of a strike drone with a large (approximately 1,800 km) combat radius. The UCLASS Research and Development program, worth $ 2.3 billion, is to begin in 2013 and the developed drones are expected to be up to combat readiness before 2020. However, there are concerns that the UCLASS program may degenerate into developing a deck drone, oriented towards intelligence, surveillance, and reconnaissance at the detriment of its strike capabilities. 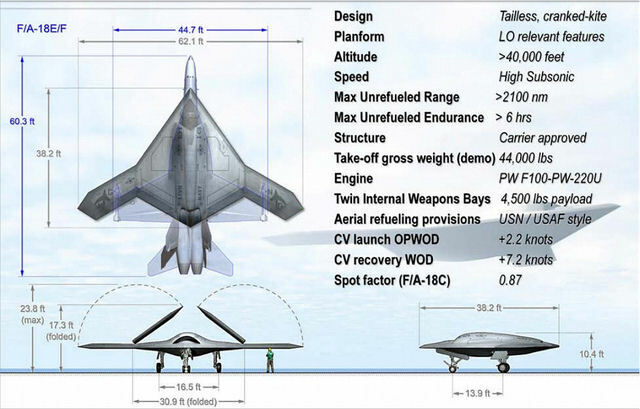 Besides, the developed UCLASS aircraft may be inferior to the existing X-47B in terms of the number of “stealth” technologies used.